How do we make rice krispie treats even better? With sprinkles and chocolate, of course! 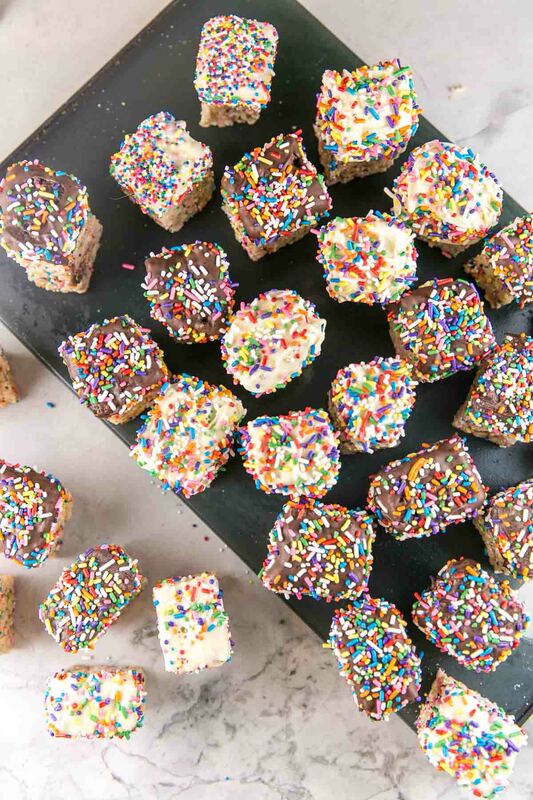 These chocolate-dipped sprinkle rice krispie treats are sure to put a smile on anyone’s face. Plus tips to keep your rice krispie treats perfectly soft! It’s January! A brand new year. A fresh start. Do you have January traditions? Sugar Free January? Dry January? Kicking off the year with Whole 30? We do things a little differently around here. 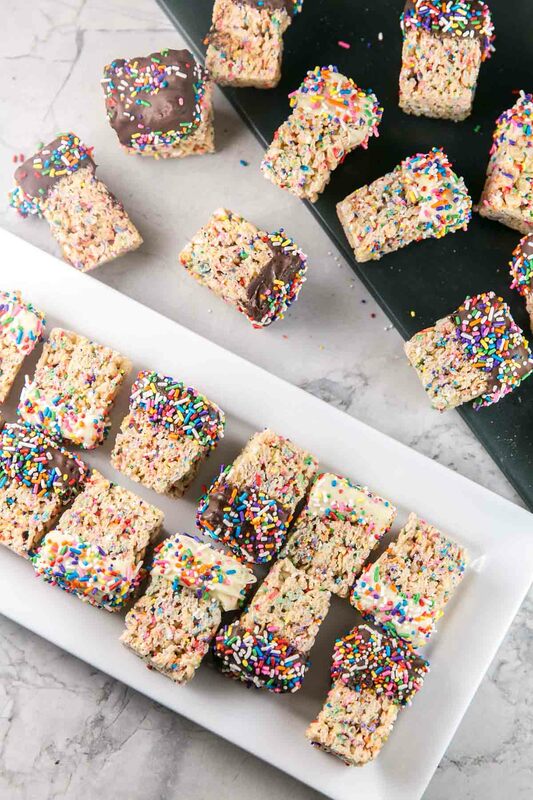 We do a sprinkle-filled January. Well, not the whole month – but my first post of the year is one that is full of sprinkles. Every year, our college friends descent from far and wide upon Philadelphia to celebrate New Year’s Eve with us. It’s become my favorite holiday by far and we are so lucky to have such a great crowd of friends who come join us annually. And then we continue to celebrate all day long on January 1st, because in Philly, New Year’s Eve isn’t the big deal — it’s New Year’s Day, thanks to the Mummers Parade. So when everyone is all “January 1st! New year! New diet! No sugar! Dry January!”… well… Philadelphia turns a blind ear and drinks another beer. 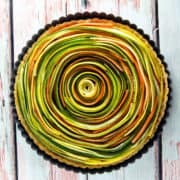 And I ignore the healthy new starts and make a dessert that is as bright and festive as the Mummers Parade, and then share it over here a week or two later. We’ve done Sprinkle Sugar Cookies and Sprinkle Sugar Cookie Bars. This year, after moving into a new house and drowning in boxes and having two children to occupy my time, we’re going easy. No bake. Less than 10 minutes of hands on time. A total crowd-pleaser. 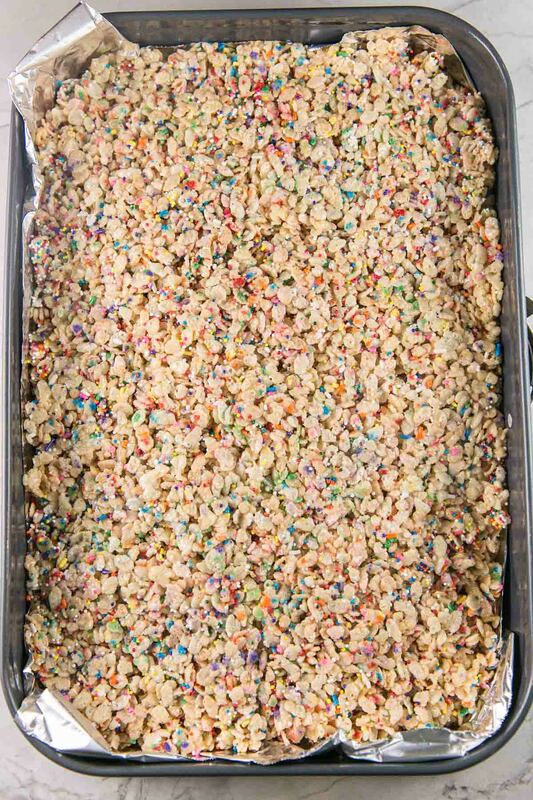 That’s right: cake batter flavored, rainbow sprinkle rice krispie treats. 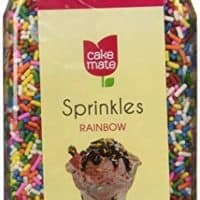 Childhood nostalgia at its finest, with an upgraded sprinkle twist. If, like me, it’s been at least 2 decades since you last made rice krispie treats, you might need a little refresher. It’s easy: all you need to do is melt together some butter and miniature marshmallows. You can use big marshmallows too, but I recommend cutting them into smaller pieces so they melt more easily. The mixture starts out really thick and goopy, but keep stirring — within 5 to 7 minutes, it will be nice and smooth. Why do marshmallows get so sticky as they melt? It’s time for a little… kitchen chemistry! Marshmallows are (usually) made out of gelatin, corn syrup, and sugar. Gelatin (or sometimes egg whites) are an important component: they allow the marshmallow to set enough to hold a shape, without forming a hard, solid structure. As we apply heat to a marshmallow, the gelatin breaks down and dissolves at a different rate than the bonds between the sugars and other ingredients. Unlike butter, which goes directly from solid to liquid, marshmallows have a transitional sticky state along the way. Just keep stirring to ensure the full marshmallow melts – soon, the mixture will become one smooth, stir-able consistency. At this point, add in the almond extract (vanilla extract if you’re avoiding nuts!) and the sprinkles and give a little stir. Pour this over the rice krispies and fold together, gently scooping the mixture up the sides of the bowl to stir. Again, avoid too much mixing to keep the color on the sprinkles! Transfer everything to a 9×13-inch baking dish. Using a piece of greased wax paper, press down gently until the mixture is spread evenly throughout the pan. 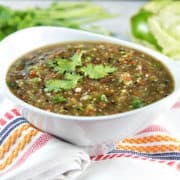 Want to make this recipe even easier? You don’t even have to turn on your stove! You can make sprinkle rice krispie treats right in your microwave, too. Microwave together butter and marshmallows at full power for 1 minute, then stir well. Continue to microwave at 1 minute intervals, stirring after each minute, until marshmallows and butter are fully melted and smooth. Then stir in the almond (or vanilla) extract and sprinkles. Have you ever had a hard and crunchy rice krispie treat? Not so good, right? Want to make sure yours are always soft? Here are two important tricks! Use Fresh Marshmallows: Have half a bag of marshmallows sitting around that are a little stale and hard? Find another use for them. You want soft, pillowy, fresh marshmallows for your rice krispie treats! And much like the butter, more marshmallows = softer treats. We’ll add in more marshmallows than the original recipe calls for, too! Don’t press down hard when spreading the mixture into the pan: It’s easy to try to squash everything down into the corners, but the more you compact the cereal, the harder the treats will get. Store in an airtight container – Store in a Tupperware-style plastic container with a tight fitting lid. How Long do Rice Krispie Treats Last? Oh, about 24 hours after making when my crowd of college friends is around! Oh wait, you’re asking how long can they actually last, assuming they’re not being devoured immediately? 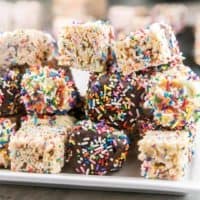 Sad but true: rice krispie treats are one of those desserts that are best fresh, so I don’t recommend making these long ahead of time. 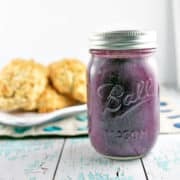 Like mentioned above, storing in an airtight container at room temperature will help keep them nice and soft longer — about 3 days max. Mixing sprinkles into rice krispie treats is fun and festive. But I wanted something really sprinkle-y for our annual New Year’s Eve tradition. So I went ahead and dipped them in chocolate (both white and semi-sweet) and covered the melted chocolate with even more sprinkles. You can use a double-boiler method to melt chocolate, but I went ahead and melted it right in the microwave. 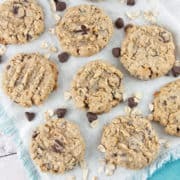 Add your chopped chocolate, a little splash of coconut oil or vegetable oil to help keep things smooth, and microwave at 50% power for 1 minute increments, stirring after each. One the chocolate is melted, dip in half the rice krispie treat, then cover the melted chocolate with sprinkles. Because that’s just what a new year needs. MORE SPRINKLES! How do we make rice krispie treats even better? With sprinkles and chocolate, of course! 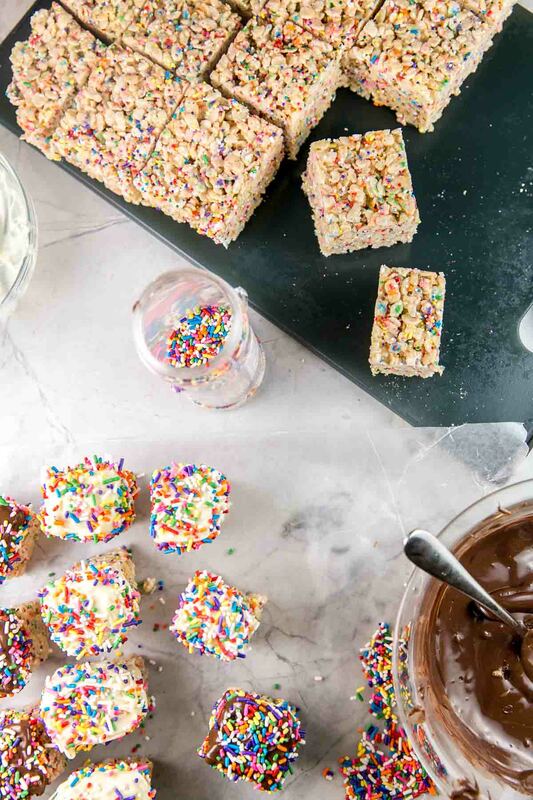 These chocolate-dipped sprinkle rice krispie treats are sure to put a smile on anyone’s face. 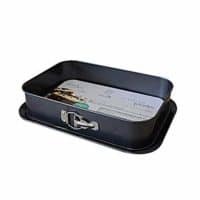 Line a 9x13-inch baking dish with foil. Grease or spray with non-stick cooking spray. In a large heavy-bottomed saucepan, melt together the butter and marshmallows over low heat. Stir continuously until the marshmallows are fully melted and the mixture is smooth, 5 to 7 minutes total. Remove from heat and add in the almond (or vanilla) extract and rainbow sprinkles, stirring gently to combine. Add the rice krispies to the pot and stir gently with a rubber spatula to coat the cereal in the marshmallow mixture. Transfer the coated cereal to the prepared baking dish. 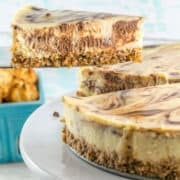 Using a piece of greased wax or parchment paper, gently push down on the top of the rice krispie treats to spread the mixture to the sides of the dish. Set aside to solidify for 30 minutes. 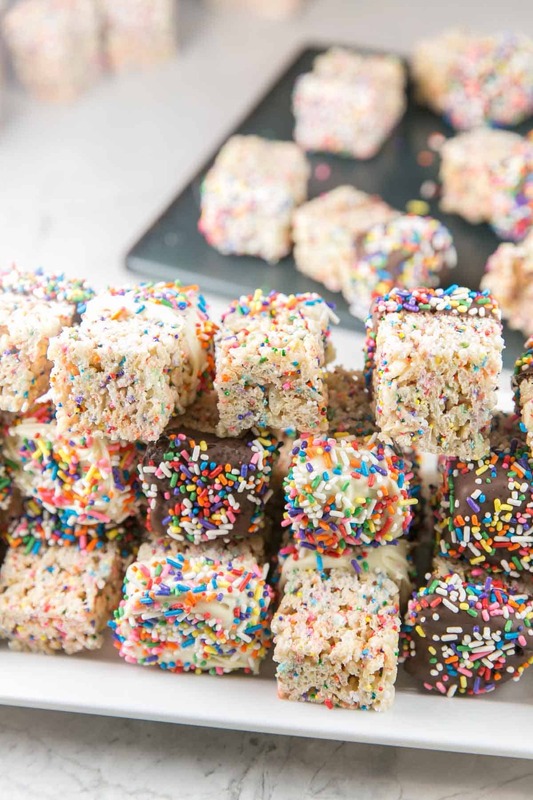 Cut the rice krispie treats into 36 bars (or 24 for larger treats). Melt together the chocolate and the vegetable oil in a microwave-safe bowl, heating at 50% power for one minute increments, stirring well after each cycle. Once melted, dip one side of the rice krispie treat in the melted chocolate and immediately top with additional sprinkles. Set aside to cool until chocolate is solidified, about 1 hour. These look fab! January is always demonised with all the diets, and millions of new exercise regimes, and this year, like you, I’ve decided to do opposite. Comfort foods and tasty treats all the way, this month is hard enough as it is, so a little treat here and there will make it more bearable for sure! What a fun way to jazz up rice krispie treats! So colorful, they will be great to make with the kids! THESE LOOK FUN FUN FUN! 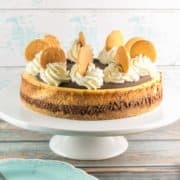 Perfect for a birthday party and I love the addition of almond essence! 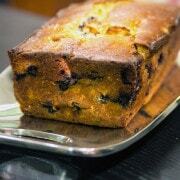 Makes it taste a bit like marzipan YUMYUM! I love the idea of a sprinkle filled January! I might just adopt that. What a great way to brighten up a dreary month with these little treats. I’m going to have to make these and I’m thinking they won’t last too long in my house either! This is a great dessert! Easy enough for when I am scrambling to make something on the fly but delicious enough to impress everyone eating them. I’m the same, no time for diets and cutting out foods – January is hard enough! These are exactly the type of treat I need instead, so colourful and fun. Plus I’ve not had a rice krispie treat in years, I need to rectify this! I’ve secretly been craving rice krispie treats since December but with all the holiday baking, I put it off. Now that I’m seeing these, I have a reason to make them! Yes! I love sprinkle filled January! We also don’t play into the sugar-free / dry / diet / etc. start to the New Year … I’m all about carrying on with life (but maybe just tweaking a health aspect or two!) These look so colorful and happy – I can’t wait to make them for a get together!! How fun is this recipe! Oh my goodness my kids are going to love these yummy rice krispie treats! Love your chemistry section! So informative! Great post!! 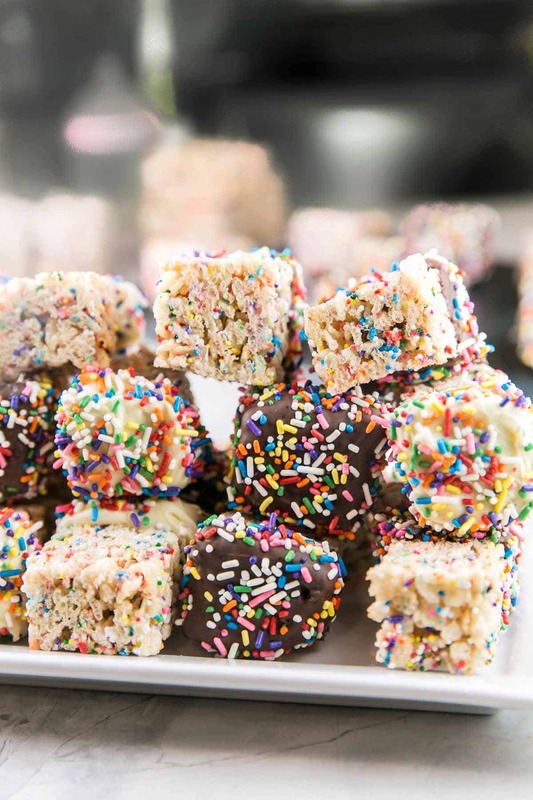 Does it get better than rice krispie treats? 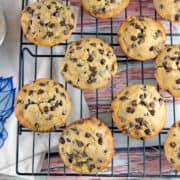 I am so guilty of making them and devouring much more on the pan than I intended. These look extra spectacular with the sprinkles. I think they’d be a great alternative for a birthday party too! 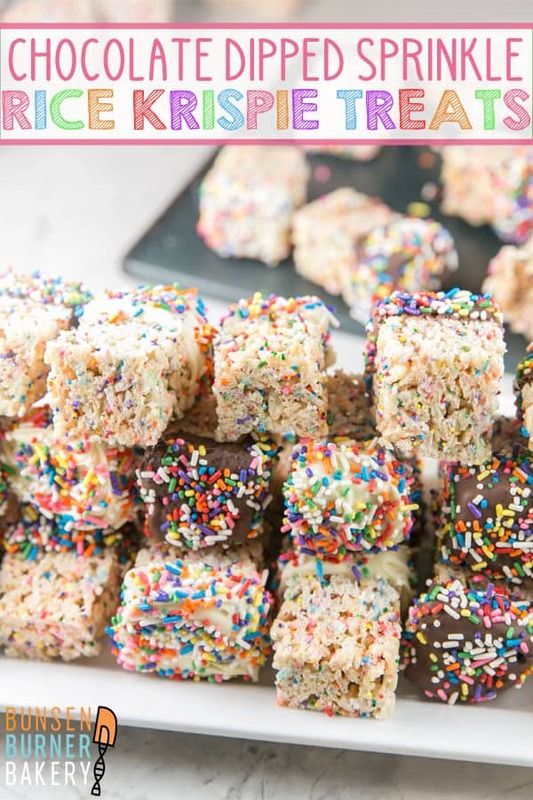 Oh my goodness, these sprinkle rice krispies making me drool here, what a fun and exciting recipe. They would be so great for kids birthday parties too.